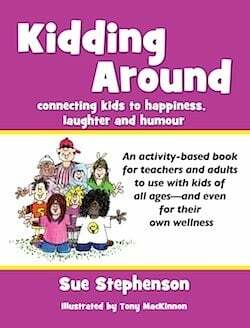 I’m lucky today to publish an excerpt from a top-notch book, Kidding Around: Connecting kids to happiness, laughter and humor, by education consultant and veteran school principal Sue Stephenson. Sue Stephenson has over 40 years of experience as a teacher, principal, staff developer, instructional consultant, author and speaker. She has written four books that focus on building trusting relationships and positive methods to cope with stress, including Kidding Around and Laughing Matters. Her keynotes and workshops focus on a passion for happiness & laughter and teamwork & trust. Contact her through her website, SueStephenson.ca, and follow her on Twitter @sue4stephenson. It was just published by Powerful Learning Press. John Norton, one of the people I most admire in the education world, is its managing editor (I’ve written a lot about John over the years). Powerful Learning Press was launched in late 2012 with this mission: We want to provide an alternative to mainstream education publishers — both for educators interested in reading about connected learning and student-driven teaching models — and for classroom practitioners ready to share what they know without having to run the gauntlet of traditional publishing. Our digital products are concise and priced well below typical professional education books. We share profits 50/50 with authors, who retain the copyright to their work. Relying heavily on social media, PLPress (a project of Powerful Learning Practice LLC) markets eBooks through our online store that are (1) works we develop through editorial partnerships with educator-authors; or (2) self-published or out-of-print works that we feel are a good fit with our mission. In addition to the eBook release of Sue Stephenson’s Kidding Around and Laughing Matters, PLPress will publish two original works later this spring: Passionate Learners: Giving Our Classrooms Back to Our Students by Pernille Ripp; and Digital Student Portfolios: A Whole School Approach to Connected Learning and Continuous Assessment by Matt Renwick. Last year we published books by primary teacher Kathy Cassidy and middle school teacher Marshal Ratzel. 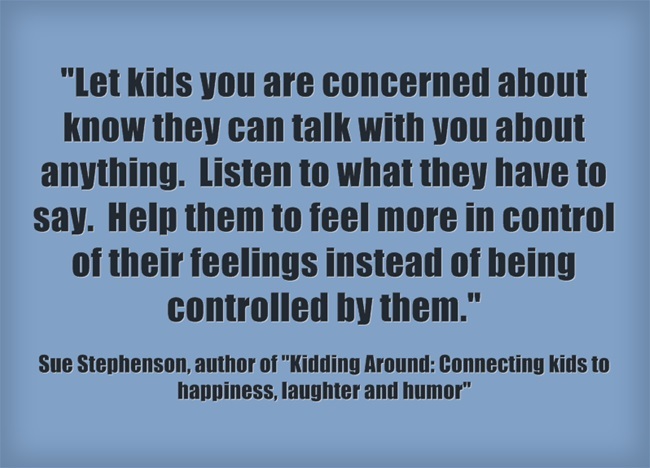 Excerpted from Kidding Around: Connecting kids to happiness, laughter and humor, by education consultant and veteran school principal Sue Stephenson. The Happiness Movement brought with it a new field focused on an interest in well-being and living better lives. Psychologist Martin Seligman coined the phrase “positive psychology” and provided a refreshing way to look at our feelings, especially happiness. He said in 2005, “I realized that my profession was half-baked. It wasn’t enough for us to nullify disabling conditions. . . .We needed to ask, what are the enabling conditions that make human beings flourish?”—“The New Science of Happiness,” Time, C. Wallis, Jan. 9, 2005. Let’s think about happiness and sadness in a slightly different way by using the Happiness Line from 0 (extremely unhappy) to 10 (extremely happy). The bottom of the line (zero) represents people with feelings of sadness, depression or being “down”. This can happen for many reasons. Some people (called “happy-chondriacs”) feel they are not meant to be happy, and live in fear of happiness. If we feel just OK or neutral (not particularly happy or unhappy), we are in the middle of the line (at 5). 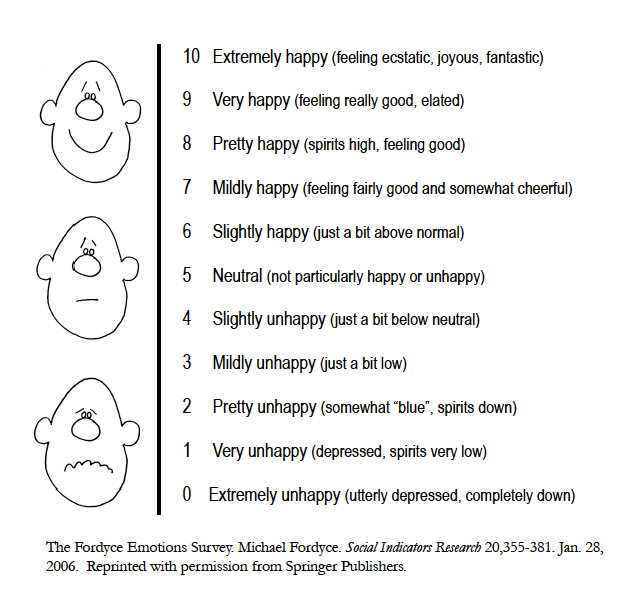 When we are feeling extremely happy, ecstatic, joyous and fantastic, we are at the top end of the Happiness Line (at 10). Research done by Ed Diener, the author of 240 scientific publications on the topic, reports that most people are mildly happy most of the time. It’s normal to move up and down on the Happiness Line daily or weekly, because our moods or emotional states change and things happen to us and our families that are sad or happy. You don’t want children to pretend to be happy. That would be phony and artificial and would cause more stress. We all have to deal with anxiety, anger, frustration and sadness. The Happiness Line helps children start to think more deeply about this range of feelings. It’s important to know that, if you end up stuck at zero for more than a few weeks, you need to reach out and get some help. Life circumstances include the country we live in and the family we have. Circumstances can improve happiness for the better, although it may be difficult or expensive to do so. They make up about 10 percent of our happiness. Surprisingly, education, race, financial income, gender and climate don’t affect happiness a great deal. The really good news is that the third category of voluntary choices, the way we act and think, is largely within our control. The effort required may be great, but the result will be more lasting. What type of and how many friends do you want to have? What will you spend your money on? How will you deal with the sad times you encounter? What type of language do you use? Are you pessimistic or optimistic? Do you reach out and help others in your community? These voluntary choices are the basis of my book Kidding Around. Let’s use a trampoline to represent the amount of happiness we inherit from our birth parents. It’s a given weight and size we cannot change—like the weather, where we live and our own level of energy. Yet we have so many choices—how often we use the trampoline, if we ask friends to join us, how high we can jump—and how safe we are while we use our trampoline. These positive effects are a dramatic argument for studying and understanding happiness. Study the range of feelings on the Happiness Line with children and students so they become familiar with the levels from 0-10. • Take a quick happiness survey. Ask children to select their own current happiness point on the line. Talk about their decision. What range is normal for them—for example, between 4 and 8? • Ask kids to start to think about how often they feel happy (6 or above), neutral (at 5) or unhappy (4 or below). Where do they hang out the most? • Ask kids to think of a time when they were at 10, 5 and 0 on the Happiness Line. Can they describe a situation for each one in a drawing or in a few sentences? What was happening? Can they recall specific details? • Ask a wider group of kids where they are on the line. There is always a range of feelings in any group and it will be interesting for kids to experience this. Kids could get to know the feelings associated with different points on the line and start to refer to them by number. Teachers could place Happiness Lines on each desk so that students could nonverbally indicate where they are when they arrive in the morning and where they move during the day. Make a larger chart or poster for the house or classroom so the Happiness Line becomes a visual aid for everyone to use on a daily basis. This would help teachers and parents know when to press and when not to interrupt. It’s natural for kids to experience a wide range of feelings. No one feels happy all the time. All feelings are acceptable and valid. It is important to get support around more challenging feelings. No one can prevent “stuff” from happening. Kids Help Phone in Canada says that “(e)very young person will experience disappointment and sadness. What’s important is how they deal with these powerful feelings.” Often the only way to get past a troublesome difficult situation is to just go through it. Having someone for help and support can make all the difference. In my book Kidding Around, I go on to talk more about what we can do “when kids don’t feel happy,” including five easy-to-remember steps kids can take when faced with intense emotions. I also talk about the important differences between sadness and depression and when mental health issues may require professional help. Among the most important things we can do is to simply remove barriers and start conversations — to be sensitive to the emotions of kids around us. Watch for kids who never seem to laugh. Try to find out more about them and start a relationship. Some may come from homes where they are taught to act “maturely.” Some come from homes where there is no laughter. Some may be abused or bullied. Some may have eating disorders or have harmed themselves. Each one has his or her own story. Let kids you are concerned about know they can talk with you about anything. Listen to what they have to say. Help them to feel more in control of their feelings instead of being controlled by them.